This is the data regulators will use to evaluate your institution's CRA Performance. The data contained in these reports is extracted from the most up-to-date Home Mortgage Disclosure Act (HMDA) Raw Data (released by the Federal Reserve each year). This data is submitted annually by all institutions to their respective federal agencies and compiled and released by the FFIEC in September. The data in raw form consists of nearly 20,000,000 records with dozens of fields of information for each record. GeoDataVision has taken this enormous volume of information, distilled it, organized it, analyzed it, and presented it in five easy to read and understand reports that depict critical Lender and Borrower information. GeoDataVision can also develop custom reports of this data on a request basis. 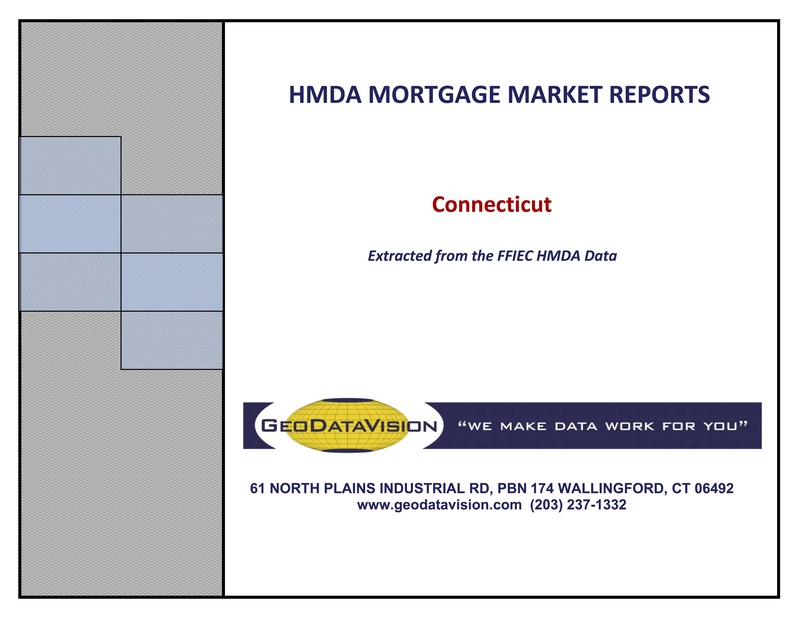 The Mortgage Market Analysis is available for any state (plus Washington, DC and Puerto Rico) or in a special product that includes the entire country. Each state contains five Lender/Borrower reports distributed in 3 profiles (Lender, Borrower and Borrower Income) in PDF format. 5. Borrower Income Profile by County and Census Tract-Units/Dollars. Note: CT and RI are organized by town, rather than by county. Data is made available on a state by state basis.